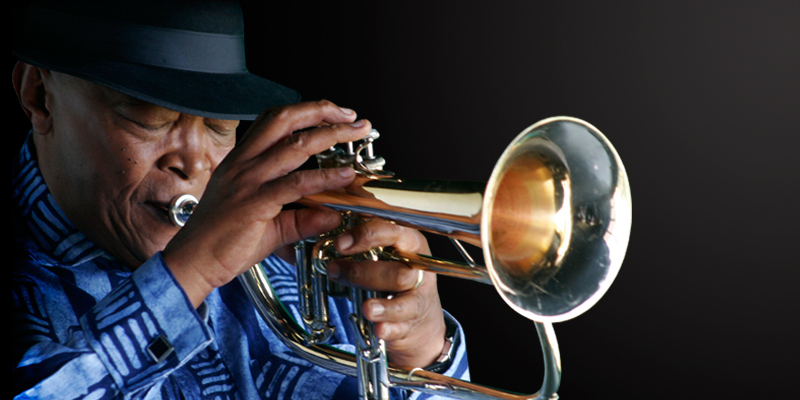 Hugh Masekela has dedicated his life to music. He first picked up a trumpet in the early ‘50s and has been playing ever since. During the last six decades he has released over 40 albums and has collaborated with musical greats such as Janis Joplin, Otis Redding, Jimi Hendrix, Marvin Gaye, Paul Simon and Stevie Wonder. 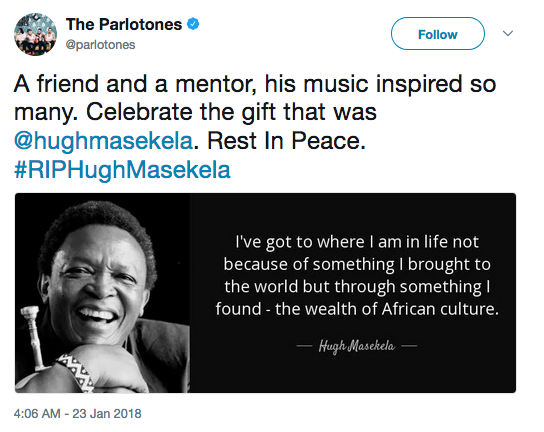 Restless, Hugh Masekela still travels to share his unique sound with the world. South African Airways and Star Alliance help him reach audiences worldwide in the comfort of Gold Status. 100 year old insurer, Assupol, will present the Hugh Masekela Heritage Festival on Saturday 28 September 2013 in the heart of Soweto. 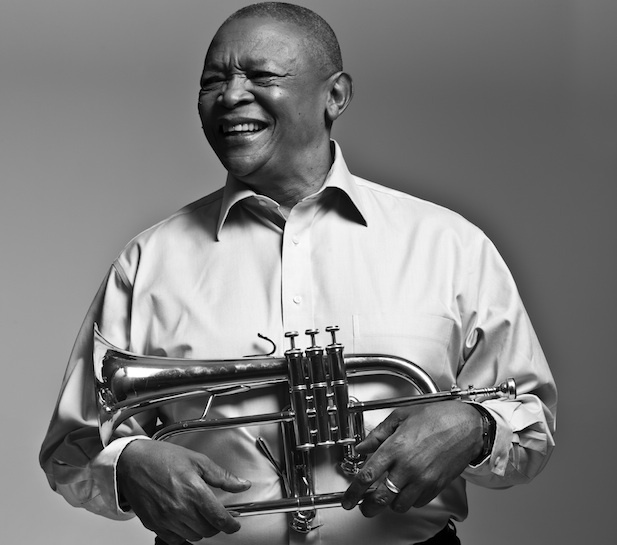 The event sees the continuation of the insurer’s collaboration with Hugh Masekela, the celebrated trumpeter, who has appeared in Assupol’s TV advertising campaign since July last year. 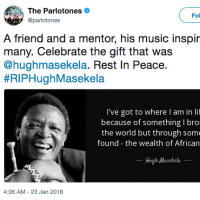 The Festival will be staged at the Soweto Cricket Oval (also known as the Elkah Cricket Stadium) in Lefatola Street, Rockville, Soweto, with an incredibly diverse line-up of supporting artists handpicked by Hugh Masekela. The line-up will include Thandiswa Mazwai, Phuzekhemisi, Mi Casa, Desmond & The Tutus, Pu2ma, Khaya Mahlangu, Jeremy Loops and of course Bra Hugh himself as the headline act. “I’m really looking forward to this festival. I always love performing in Soweto and with this wonderful and eclectic array of talent on the line-up, I think it’s going to be a very special day”, says Hugh Masekela, who at 74 years is showing no signs of slowing down. He has also recently released a new album called “Playing At Work” to positive reviews. 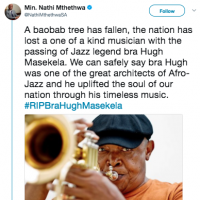 The Hugh Masekela Heritage Festival aims to become an annual event moving forward, to celebrate Heritage month and to honour the people of Soweto. Annelize van Blerk, Head of Corporate Affairs at Assupol, said: “Bra Hugh has a busy international touring schedule and it is only an honour for us to bring him to Soweto, a township that has supported and influenced his music over the years”. “For us this concert is a fitting way to celebrate 100 years of Assupol, with a legend in the South African music industry who like Assupol, has stood the test of time”, she continued. This concert is made possible by Assupol and supported by Soweto TV and Jozi FM. Sixty of South Africa’s top talent have joined the fight against poverty and unemployment this festive season by contributing work pro bono to The Big Issue’s 2012/2013 Collector’s Edition. 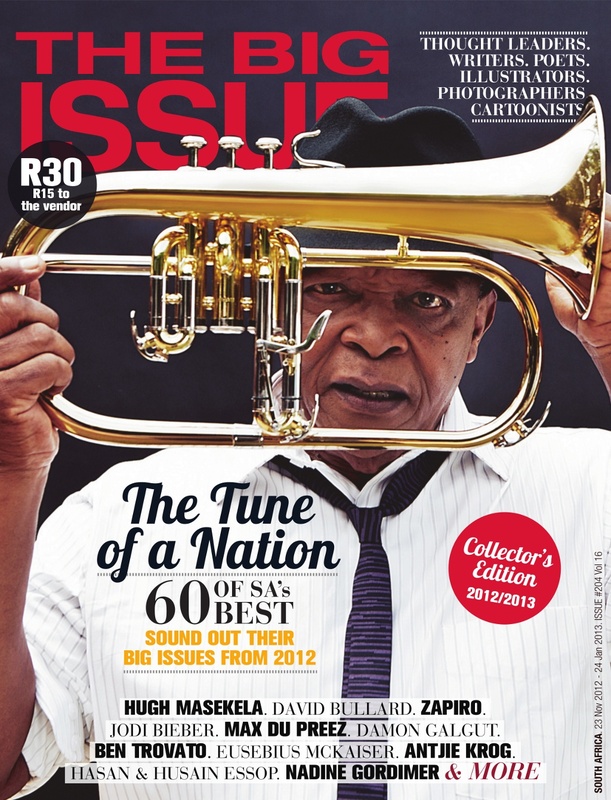 All 60 contributors submitted work under the theme of “My Big Issue” to create the bumper 92-page edition, printed on high quality paper and featuring the legendary flugelhornist, singer and defiant political voice Hugh Masekela on the cover. The weighty edition boasts a large number of the “who’s who” in South African literary, cartooning, photography, illustration and poetry circles, including Nadine Gordimer, Max du Preez, Ben Trovato, Zapiro, David Bullard, Jodi Bieber, Antjie Krog, Terry Crawford-Browne, Eusebius McKaiser and Damon Galgut, to name but a few. It also features a full complement of up-and-coming talent, such as Shubnum Khan, Hasan and Husain Essop, Leonie Joubert, Osiame Molefe, Jen Thorpe, David wa Maahlamela and Dorothy Black (full list below). “For the third year running we’ve been overwhelmed and very humbled by the incredible support we’ve had from South Africa’s best talent. Every one of them gave selflessly of their time and talent to make this special edition possible,” said Melany Bendix, editor of The Big Issue. The Big Issue is usually sold for R20 with vendors earning 50% of the cover price. By increasing the cover price to R30 for the 2012/2013 Collector’s Edition, vendors earn R15 for every copy sold and are thereby able earn their own year-end bonus. In addition to earning more per magazine sold, Bendix also expects vendors to sell far more copies than usual. The 2012/2013 Collector’s Edition will be available from vendors at pitches throughout the Cape Town CBD and the greater Cape Town area from November 23 to January 25, 2013 — or while stocks last. ‘Music, wine, food and good company are the best combination’ says Marcel van der Walt, vintner at Veenwouden and Hugh Masekela’s latest partner in collaboration. This heady mix was at its best last Sunday as the House of Masekela launched Veenwouden’s new Hugh Masekela Collection at Signature Restaurant in Sandton, Johannesburg. Incomparable pianist, Larry Willis, joined Bra Hugh to celebrate the release of the wine, perfectly timed to coincide with the release of their latest joint album: Friends, a 4 CD box set of jazz standards that serves as the long-awaited sequel to Almost Like Being in Jazz. The audience was treated to a selection of numbers off the album, as well as anecdotes from Larry and Hugh’s shared years at the Manhattan school of Music in the early 60s, when the two spent every night in clubs watching and learning from talents like Miles Davis, John Coltrane, Thelonious Monk, Charlie Mingus and Max Roach. 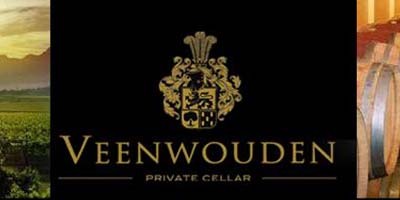 The music and laughter continued as three delicious courses were served – carefully chosen to whet the appetite for the main attraction: Veenwouden Private Cellar Hugh Masekela Collection 2012. Van der Walt envisions this release as being the first of many inspired by Masekela’s music. Friends brings together two lifelong friends, who have both pushed the boundaries of excellence in their instruments, to play music from the golden era of jazz. The first release from the Hugh Masekela Collection needed to be a tribute to these greats and also the perfect drinking accompaniment when listening to the album. Van der Walt had this in mind when he hand-selected the perfect grapes from Veenwouden’s 2011 vintage. The result is a well-structured blend with the mineral backbone of Cabernet Sauvignon, softened by velvety Merlot. Bold dark fruits with a hint of spice give way to deep blackcurrant molasses that lingers on the palate long after the last sip. Already delicious, this complex wine has been designed to age for up to 20 years. Signature Restaurant in Sandton was the perfect choice as launch pad for this special collection. Owner, Desmond Mabuza, opened the venue 3 years ago with the aim to bring excellent food, great service, classy ambience and outstanding entertainment under one roof. He certainly has succeeded. Despite the local and worldwide recession in recent years, Signature has thrived from day one. The restaurant offers live music nightly from Monday to Saturday and at lunch time on Sunday’s. Hugh Masekela and Larry Willis are without doubt the biggest stars yet to grace Signature’s stage and Mabuza hopes that this is just the beginning of a tradition of top-drawer events in this premium setting. Only 1000 bottles of the Veenwouden Hugh Masekela Collection 2012 have been released worldwide, 500 of these available in South Africa, making this wine a true collector’s item. To make this purchase even more special, the House of Masekela has designed gift-packages that include the Friends box set. The time is now, it’s time to Thrive. African Jazz legend Hugh Masekela, and BET Best International Africa nominee, Lira, have lent their voices to ONE’s Thrive campaign to raise awareness of the importance of investing in agriculture and nutrition. 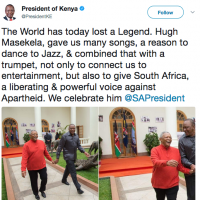 These two jazz maestros each recorded a radio announcement in support of ONE’s petition that will be delivered to African leaders at the African Union summit in July. These announcements are currently in rotation on Capital FM in Malawi, and now you too can hear these poignant and inspirational messages here. March 21st, 2012. UNESCO Director-General Irina Bokova and UNESCO Goodwill Ambassador Herbie Hancock are pleased to announce International Jazz Day to be held April 30th of every year. In partnership with the Thelonious Monk Institute of Jazz, the initiative– Hancock’s first major program introduced as a Goodwill Ambassador–will encourage and highlight intercultural dialogue and understanding through America’s greatest contribution to the world of music. International Jazz Day will foster and stimulate the teaching of jazz education with a particular emphasis placed on children from disadvantaged communities in classrooms around the world and will be offered to all 195 member states of UNESCO. 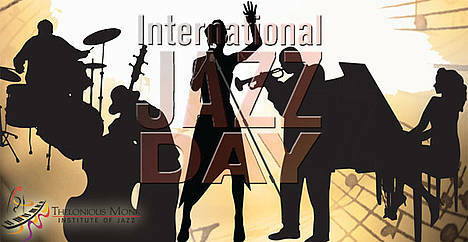 Said UNESCO Director-General Bokova, “The designation of International Jazz Day is intended to bring together communities, schools and other groups the world over to celebrate and learn more about the art of jazz, its roots and its impact, and to highlight its important role as a means of communication that transcends differences”. In anticipation of April 30th International Jazz Day, the celebration will kick-off on April 27th at UNESCO Headquarters in Paris with a daylong series of jazz education programs and performances. An evening concert will feature Herbie Hancock, Dee Dee Bridgewater, Marcus Miller, Hugh Masekela, Lionel Loueke, Tania Maria, Barbara Hendricks, Gerald Clayton, Terri Lyne Carrington, John Beasley, China Moses, Ben Williams, and Antonio Hart, and others to be announced. The daytime events will include master classes, roundtable discussions, improvisational workshops, and various other activities. International Jazz Day will be celebrated by millions worldwide on Monday, April 30th and will begin with a sunrise concert in New Orleans’ Congo Square, the birthplace of jazz. The event will feature a number of jazz luminaries along with Hancock including Dianne Reeves, New Orleans natives Terence Blanchard, Ellis Marsalis, Treme Brass Band, Dr. Michael White, Kermit Ruffins, Bill Summers, and others. The world-wide programs and events will conclude in New York City at the United Nations General Assembly Hall with an historic sunset concert certain to be one of the most heralded jazz celebrations of all time, with confirmed artists including Richard Bona (Cameroon), Dee Dee Bridgewater, Danilo Perez, Derek Trucks and Susan Tedeschi, Jack DeJohnette, Herbie Hancock, Jimmy Heath, Zakir Hussain (India), Angelique Kidjo (Benin), Lang Lang (China), Romero Lubambo (Brazil), Shankar Mahadevan (India), Wynton Marsalis, Hugh Masekela (South Africa), Christian McBride, Dianne Reeves, Wayne Shorter, Esperanza Spalding, Hiromi Uehara (Japan) and others to be announced. George Duke will serve as Musical Director. Confirmed Co-Hosts include Robert DeNiro, Michael Douglas, Morgan Freeman and Quincy Jones. The concert from the United Nations will be streamed live worldwide via the United Nations and UNESCO websites, and will also be post-broadcast on United Nations Radio. • Contribute to UNESCO’s initiatives to promote mutual understanding among cultures, with a focus on education of young people in marginalized communities. The Thelonious Monk Institute of Jazz will work with UNESCO and its 195 various field offices, national commissions, UNESCO networks, UNESCO Associated Schools, universities and institutes, public radio and public television, as well as NGOs. Additionally, libraries, schools, performing arts centers, artists and arts organizations of all disciplines throughout the world will be encouraged to celebrate the day through presentations, concerts, and other jazz-focused activities. UNESCO will be sending recommendations for events, programs and support materials to its member countries and efforts are underway to raise funds for activities in developing countries where resources are limited. For example, in Brazil the Ministry of Culture will organize a nationwide program celebrating the history of jazz and its contribution to peace in all of its cultural centers; it is hoped that this will eventually be integrated into Brazil’s national educational curriculum. In Algeria, free jazz concerts will take place featuring groups from all over the country as well as conferences promoting “intercultural exchanges between jazz music and Maghreb music”; Russia will host various activities including concerts, photo exhibitions, lectures, virtual magazines and radio programs, while in Belgium the Conservatory of Jazz and Pop will organize outdoor daytime flash mobs/ concerts with Jazz students in bookstores, the Academy of Fine Arts and more. These are just some of the many local events that will be taking place around the world. Soccer fans remember ESPN’s coverage of the FIFA World Cup in 2010. The obnoxious vuvuzela horns that prompted some TV watchers to turn down the volume, but there was also an insightful pieces called ‘Umlando ­ Through My Father’s Eyes.’ Here ESPN correspondent Sal Masekela (often found working the X Games) did a series of ten intimate 4-5 minute segments revolving around his legendary father Hugh Masekela’s return to various spots around South African that he remembered from growing up as well as what life was like back then under Apartheid. 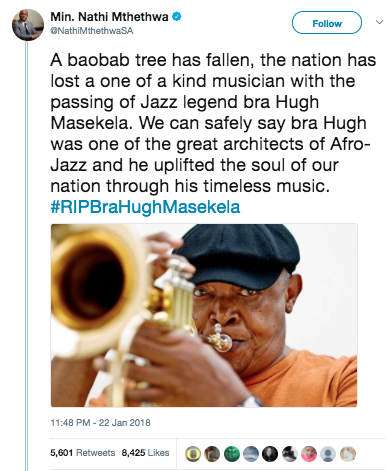 Exiled in 1961 as part of an Apartheid campaign, Hugh Masekela moved to the U.S. worked as a jazz bandleader and had a hit with groovy pop instrumental ‘Grazing in the Grass’ in 1968, which shot to the top of Billboard’s Hot 100 and the album ‘Promise of a Future’ went on sell over 4 million copies worldwide. 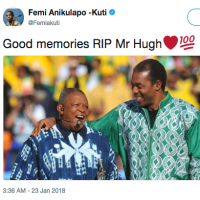 Even before the World Cup exposure, the flugelhorn and cornet player had grown to become a global jazz and world music icon. He remains active and now returns with a varied collection of traditional South African wedding songs called Jabulani. 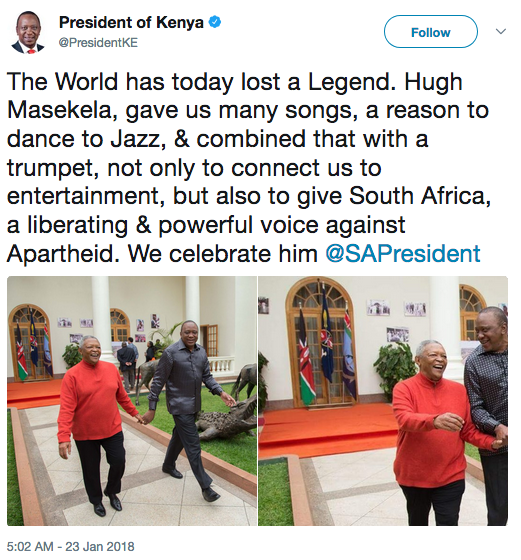 So even though Maselkela will play in front 15,000 on the main stage of this year’s Cape Town International Jazz Festival in March, the 73-year-old star needed some fresh thinking about how to reach his international audience using both traditional and modern tools. Enter the label Listen 2 Africa, which is part of recently launched endeavor called Listen 2 Entertainment Group helmed by Dave Love that offers management, publishing (Buntz Music ASACP & Música De Amor BMI), production services, consulting, administration and tour support. Listen 2’s boutique label has also put out high profile releases by South African act Ladysmith Black Mambazo as well as smooth jazz artists like Candy Dulfer and straight ahead jazz people like Michael Brecker. Love released Masekela’s ‘Revival’ in 2005 when he oversaw the Heads Up label from 1989 to 2009 when Concord, who bought Heads Up and its sister company Telarc in 2005, moved operations to its offices in L.A.
During his time at Heads Up, Love worked with smooth jazz artists like Marion Meadows, more straight ahead musicians like Esperanza Spalding (who was one of his last signings for the label) as well as South African artists. Through work with George Duke, Stanley Clarke and Take 6, Love has gown his databases of Adult African American audiences. Love also worked with NPR to grow the audience as he sought to introduce or reintroduce these South African acts to consumers. When things changed with Heads Up, Love wasn’t certain that he wanted to get back into the record business. He was enjoying his non-label ventures ­ Love is also partner in Innovative Entertainment Solutions, a web based marketing company specializing in e-commerce, which provides artists and companies the ability to sell digital and physical products through their own branded store. But the opportunity presented itself when his former artists came looking for his expertise to help guide their careers on a variety of different levels ­ Love is North American management for Esperanza Spalding and others through a partnership with Montuno S.L., a Barcelona based management and production company. Love also signed a deal with the New York-based Razor & Tie, which has distribution through Sony and RED. Love believes is the best-case scenario. With Hugh Masekela, Love’s campaign is a mix of old school savvy and new school technology. Masekela is currently in the midst of an 11-date North American tour that hits performing arts centers, colleges and clubs in primary and secondary markets. 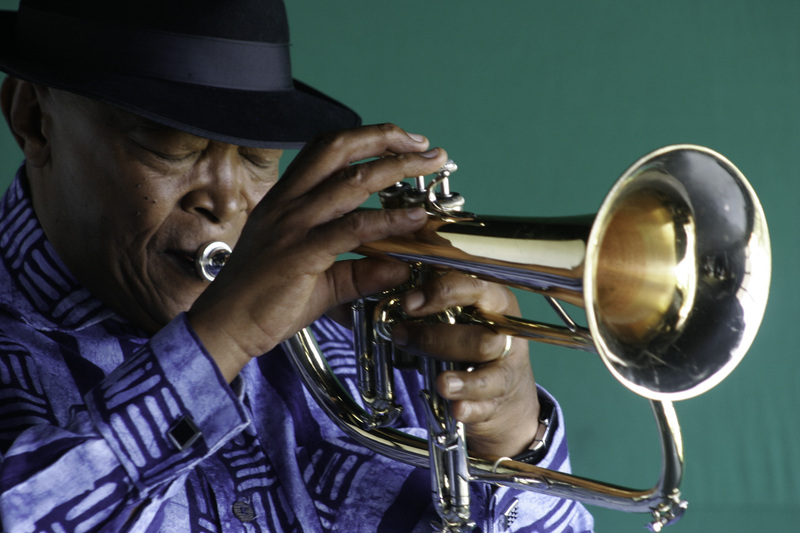 A galvanizing live performer with a hot young band, Masekela tours around the world regularly, but not often in the U.S. to the extent of this current tour. Love made other changes as well, ones that bring this heritage artist into the 21st Century. 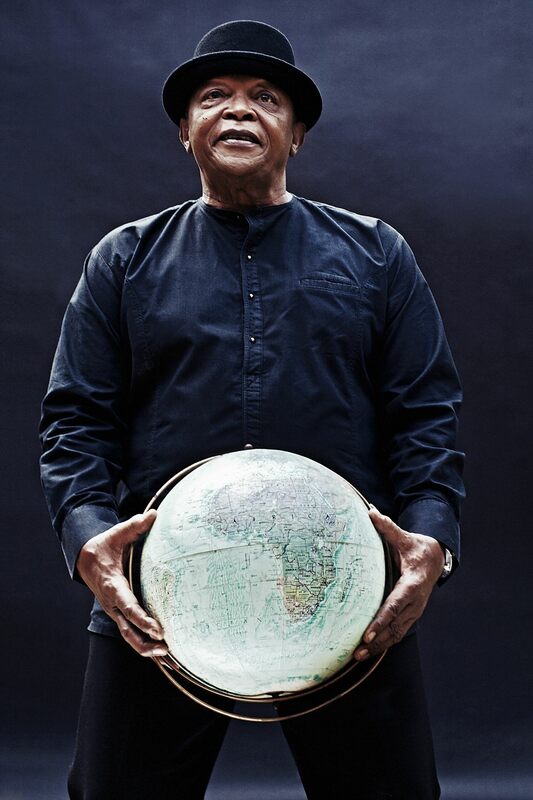 As our Hungry No More campaign continues, famed musician and trumpeter Hugh Masekela joins us in calling on African leaders to focus investments in their agricultural sectors, which will contribute to growing their economies and reducing extreme poverty. 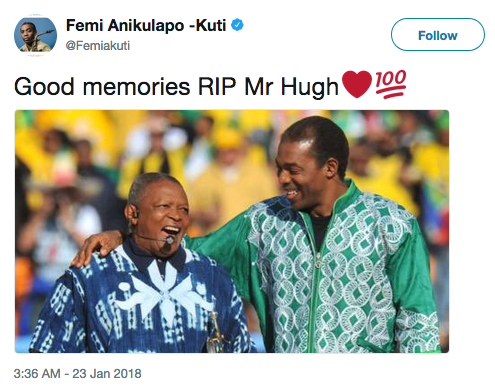 Hugh’s support couldn’t come at a better time as the African Union Summit begins this week with our Heads of State in Addis Ababa. Now’s the perfect opportunity to continue our campaign and press our leaders to take action. We’ll be presenting your petition and signatures at the AU later this week! As our leaders prepare to meet next week in Ethiopia to attend a critical summit, please join me in signing ONE’s petition. We are haunted by the famine in Somalia that has killed 30,000 children in 3 months. We respectfully request that you help make this the last famine by: 1) supporting delivery of promised emergency aid; 2) increasing effort on peace and security; 3) keeping the long-term promise toward spending 10% of national budgets on agriculture and food security; and 4) doing so transparently, so citizens can ensure this money is well spent. With access to suitable seeds, technologies, and improved connections to markets, small-holder farmers can generate more income, send their children to school, help to keep food prices affordable and help lift their communities out of poverty. When they meet next week our governments must show real leadership and ensure this is the last famine in Africa. Join Hugh and our partners in signing the petition today.